The results of the analyses, orchestrated by IRFU/DPHP physicists, led to the observation of this rare process and are in agreement with the predictions of the standard model. In the coming years, both experiments will collect much more data and improve the accuracy of their measurements, which could reveal a deviation from the prediction of the standard model. 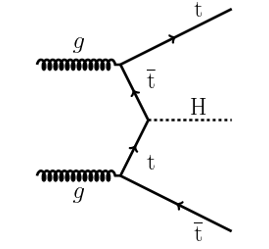 Production diagram of a Higgs boson in association with a pair of top and antitop quarks. As explained in the previous highlight (Nov 2017), the measurement of the coupling of the two heavyweights of the standard model, the Higgs boson and the quark top, is an important test of the standard model. The aim is to measure the production rate of Higgs bosons in association with a pair of top and antitop quarks (ttH), a rare process which observation requires a large amount of data and meticulous analysis. The method to know if the production (ttH) exists is to compare the measurement (observed or simulated) with a prediction where it would not exist (no signal). The observed difference is subject to statistical fluctuations measured in terms of the number of sigma (σ). To talk about discovery and confirm a measurement, you need "a 5 sigma signal", which means that there is only a 1 in 1.7 million chance that the difference is due to a statistical fluctuation. This is the limit that scientists have drawn between the simple "statistical fluctuation" and the "significant signal". 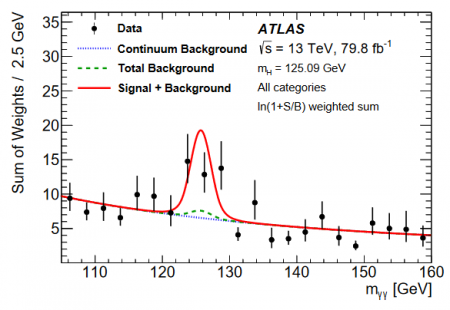 The ATLAS and CMS analyses described here, based on data recorded during run 1 (2010-2012, at 7 and 8 TeV proton-proton collision energy) and run 2 (since 2015 at 13 TeV), do not cover the same amounts of data and are therefore not directly comparable. On the other hand, the two analyses confirm, once again, the standard model. 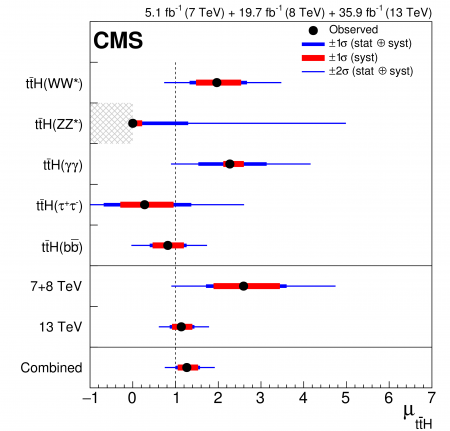 Values measured of the mu_ttH parameter (ttH observed production rate compared to the expected rate in the standard model), with uncertainties at 1 and 2 sigmas, for each decay channels as well as for the combination of the results from the CMS experiment. The expected value in the standard model, 1, is represented by the dotted vertical line. The combination of the results of run 1 to 7 and 8 TeV (about 25 fb-1) and the 2015 and 2016 results of run 2 (about 36 fb-1) made it possible to observe the presence of ttH events with a statistical significance of 5.2 standard deviations (5.2 σ), above the threshold of 5 standard deviations traditionally required to claim a discovery. This result combines several independent researches of Higgs boson production associated with a pair of top-antitop quarks already made public: researches with a Higgs boson decaying into pairs of W or Z bosons, τ leptons, b quarks or even pairs of photons. The IRFU/DPHP CMS group was in particular the author of measurement performed in the two-photon decay channel. The figure on the side shows the statistical and systematic uncertainties of each measurement, showing that the diphoton channel (γγ), largely dominated by statistical uncertainties, will benefit greatly from the addition of new data and will ultimately be the most sensitive to measure this coupling. The 2017 run 2 data are being analyzed at IRFU in the diphoton channel. The teams hope to provide results with even greater sensitivity very soon (next summer conference). Spectrum of the reconstructed mass of photon pairs after event selection by a multivariate method in the ttH(photon photon) ATLAS analysis. The peak at 125 GeV corresponds to the ttH (photon photon) signal. The November 2017 results (2015 and 2016 data) (see highlight in French 1), which combine the decay of the Higgs boson into pairs of quarks b, W+W-, ττ, γγ and ZZ, were improved by adding the 2017 data to the γγ analysis, as well as a more sophisticated use of multivariate machine learning methods applied to the same analysis. The figure on the side shows the γγ invariant mass distribution for the events selected in the ttH analysis, the peak corresponding to the mass of the Higgs boson being detached from the background noise. The statistical significance observed with run 2 data is 5.8 σ. By combining the analyses at 13 TeV (run 2) with those at 7 and 8 TeV (run 1), the statistical significance is 6.3 σ. Assuming that the decay probabilities of the Higgs boson in the different channels are in agreement with the standard model, the total effective cross-section of ttH production at 13 TeV is measured at 670 ± 90 (stat.) + 110-100 (syst.) fb, in agreement with the standard model prediction of 507 +35-50 fb.